Today I met with the orthopedist for an evaluation of my broken ankle bone. Good news is the foot's not broken in the usual places for this kind of injury. Instead I broke a piece, a corner, if you will, off the outside ankle bone, the lateral maleolus. 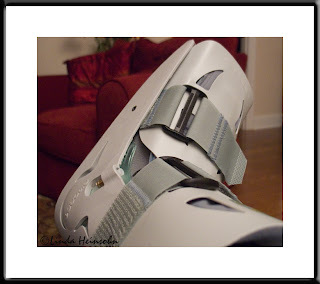 I need support while the bone heals but I am cleared to walk if I want while using this storm trooper boot. After sitting around making a little nest around one end of the couch recliner for the past week, it's a joy to be able to move about again! I feel let out of broken foot prison! That said, it's still slow going. For now I am still needing one crutch to help stabilize myself. And the boot is nothing if not clunky and inflexible. My ankle does hurt a lot and is very swollen. I'll be four weeks in this cast then we'll see what's up after that. I wonder if I can get a refund on my dance lessons I was to start next week?